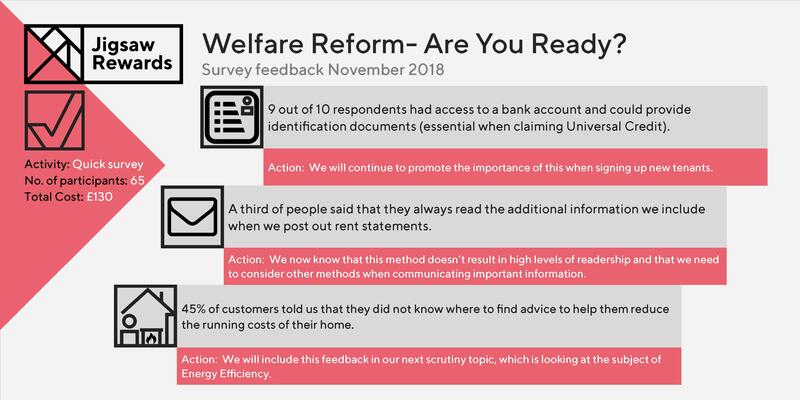 Jigsaw Rewards detailed survey feedback – ‘Welfare reform are you ready’? We are carrying out a tenant led scrutiny project to explore how prepared our customers are for welfare benefit changes, in particular Universal Credit. The responses to the survey helped us to understand the support needs of our customers and the best ways to provide information. Our customers are generally able to provide at least one piece of photographic identification. Please click here to view the full survey results. Home > News > Jigsaw Rewards detailed survey feedback – ‘Welfare reform are you ready’?